While in Hyderabad, I used to see a lot of Paniyaram Pans / Pancake Poppers / Aebleskiver Pan on sale in every shop!! Even our local super market stored them in abundance!! But never gave much thought to it as I wasn’t ready to invest more time and energy into learning something new to cook.. Yeah, i kinda hated cooking then. But with my new found love for cooking and blogging, I once again came across the Paniyaram pans. This time on various food blogs!! And when I saw Linsy, Manjula and many other food bloggers whipping out some yummy, cirspy yet low oil Paniyaram, I knew it was time I bought one too!! So I went and bought one and have been experimenting with a lot!! So I made the regular Kuzi Paniyaram in it using idli batter. But the need for some cooking adventure was still there. So I made Bhajia (inspired by Linsy), they were tasty!! Hence I further experimented and decided to make methi na muthiya in paniyaram pan. Here is the recipe of Muthiya in Paniyaram Pan (appa patra). 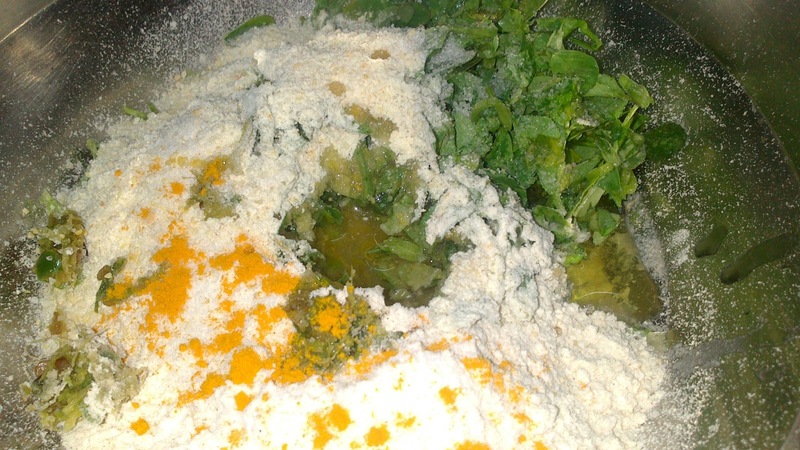 1) Mix all the 3 flours and Methi, add salt, turmeric powder, green chili and ginger paste, hing and 3 tablespoon oil. Mix well, but don’t knead with pressure, if you do vigorous kneading then methi leaves water. Flours + Methi + Oil + Masala = gate to heaven!!! 2) Now, add curd spoon by spoon and mix well. You should get thicker than dosa (pancake) batter. Add a tablespoon water if you have to. 3) Heat the paniyaram pan on medium flame. Drop a little oil in each groove and sprinkle some til (sesame seeds) in each groove. 4) Once the tils crackle, using a spoon add batter in each groove of the paniyaram pan. 5) Let it cook on one side. Once that side is browned, flip them. Let the other side get browned too!! And your crispy, low oil and quick to make methi muthiya is ready!! Previous Post: Whole Wheat Chocolate Cookies..
Good that you gave option for the chakkiwala, really don't know what it is all about. Grew up eating lots of different types of paniyaram made my mummy. Ok, I don't have the pan but I'm sure a twist can be given, muffin pans and bake them. Thanks for the mention. If I can bring this pan here, you are there, u should use it, now will get more ideas, this I yet to try it. Very delicious sis and love that you made it paniyaram pan…. Nice idea and gr8 looking muthiyas too! Lovely ! great idea !